Welcome to Ward 5 Online: Jane's Walk Tour of Magoun Square Tomorrow! Jane's Walk Tour of Magoun Square Tomorrow! 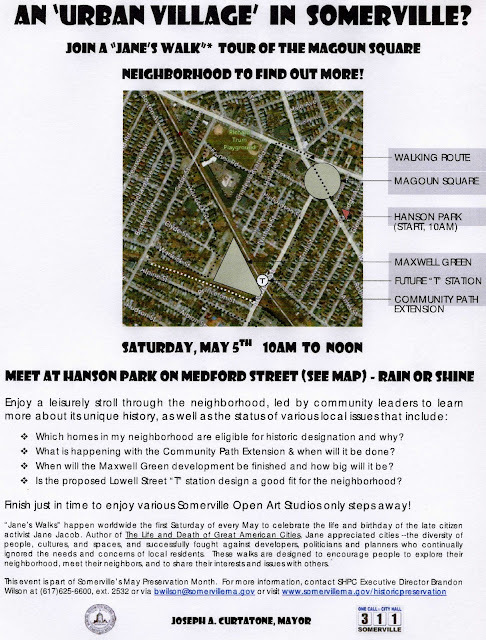 Tomorrow, May 5th, a walking tour of Magoun Square will take place from 10am to Noon, starting at Hanson Park! Wish we could make it, even though we do roughly the same walk about 4x a week. Soccer games prevail however... what else is new! It was quite fun and informative. Great historical things about the city that I didn't know.